So apparently in the newsroom at the Wall Street Journal they pretty much all hate Goatberg and they have this game they play where every time Goatberg publishes a column they count how many times he uses the word “I” — and it’s usually a lot. They also count up other “me-related” words like me, mine and my. The joke at the Journal is that someday Walt will publish a column where every word is I. Really? You’ve been testing it out? Geez, Walt, it’s a good thing you told us that you’ve been testing it out because if you didn’t tell us that we might not have been able to figure that out from the rest of the column where you explain how it works. Anyway, the point is that Walt kind of likes himself. A lot. He’s got this little teeny tiny ego problem. And the editors at the Journal can’t rein him in because he is the Great and Powerful Goatberg, king of all tech journalists. Katie and the folks in the PR department just learned about the Goatberg Game from one of the beat reporters at the Journal. Now they’re keeping track too. 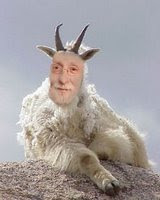 In case you’re wondering, toay’s Goatberg column about the ChaCha service contains a total of 841 words, and 13 uses of the first-person pronoun. Not even close to the record, apparently, but still pretty good. Peace out.